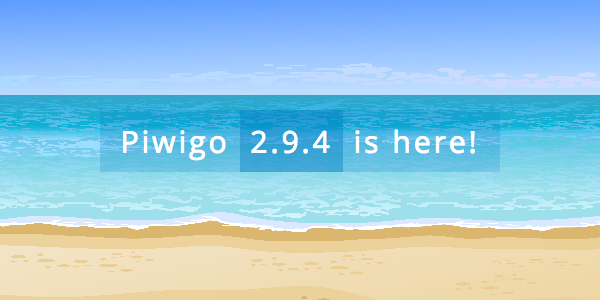 Piwigo 2.9.4 is ready for new installations and updates. Several security issues were fixed, special thank to Henri Salo for his follow-up on security issues. Thank you to our community members for reporting bugs and pushing pull-requests on Github : idbartosz, nitro322, Daniel Dadap, SergeD, Sam Wilson, Aki and Rob Lensen for his work on PHP 7.2. Thank you also to translators : 17 languages were updated in this release. Some important changes were made to make Piwigo compatible with PHP 7.2. Unfortunately (or not...) it means Piwigo is no longer compatible with PHP 5.2. PHP 5.3 is now required to run Piwigo 2.9.4. Am trying to figure these out but if i havent edited it any solutions would be awesome. I assume these errors are from the plugins. Those are Deprecated and Warning messages, not errors. Search in the forum, you'll find a gazillion threads where people posted that without searching first and some threads have an answer, each one posting those without searching first makes it harder for everyone else to find the right answer. the problem is, admin tools, with the error I posted above, prevents people from uploading photos to their gallery whatsoever. Getting error after upgrading to 2.9.4. The site is now completely inaccessible. how do I recover from this ? Thanks for keeping it up, guys! Piwigo is great. Regarding errors, I note that $conf['show_php_errors'] = E_ALL; is set as default, casuing all these problems. This should aways be set to 0 on a production site. B.t.w. my admin tools work as expected, running PHP 7.2. @plg I can change the PHP version to 7 if that will help - higher than 5.6 if required. Will moving to 7.0 help the situation? If I do move to 7.0, should the site start working again or are there additional steps needed - perhaps a manual reinstall ? yep, done. for now, I deactivated it so I can upload some photos to the gallery.